Accessible Seating tickets can be found in sections 1, 2, 4, 6, 8, 16, 19, 21, 23, 24. Please choose one of those sections, click "Select Seats," and then click on the seats that will accomodate your needs. Clicking on the icon will show you a photograph from that part of the venue. 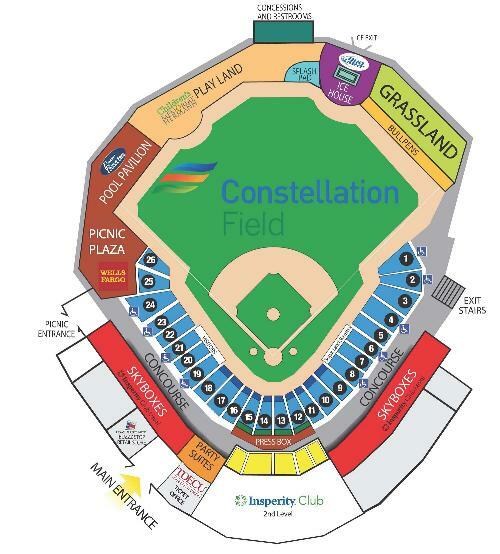 When choosing your seats, please note that Seat 1 is on the right side of the aisle (closest to Section 1) and Row A is closest to the field. Sections 9-18 are behind the protective net. Kids under 12 receive a free grassland ticket when wearing their little league uniform. - Gates open one hour before scheduled first pitch. - For Sugar Land Skeeters games, parking is $5 per vehicle. Current Military and Veterans park for free by showing a valid ID or with state issued plates. - All game times and promotions subject to change without notice. CONVENIENCE CHARGE: $1.00 per ticket charge will be assessed at checkout. NOTICE: All sales are final. Includes taxes and applicable fees. No refunds. No exchanges. Check date and seat locations very carefully before purchasing.